The economic impact of immigration, human trafficking and forced labour, reintegration of migrant workers, debt as a driver of migration, education standards of children left behind by migrants, and health of migrant workers are some of the key areas where there are gaps in research and policy, the recent Policy Engagement Forum on migration identified. The Forum was organised by the Institute of Policy Studies of Sri Lanka (IPS). 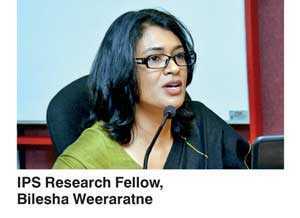 Research Fellow and IPS Migration and Urbanisation Research Program Head Dr. Bilesha Weeraratne noted that migration trends and patterns in Sri Lanka have changed over recent years, especially with more males migrating than females. This means that new issues related to migration emerge, she pointed out. And so, research and policy priorities for Sri Lanka in terms of migration need to refocus, she highlighted. Identifying research gaps and new research areas, possibilities of collaborative research oriented towards policy are the main objectives of IPS’ Policy Engagement Forums. The roundtable discussion saw the participation of many key stakeholders working on migration-related issues such as public officials, international organisations, civil society organisations and the academia.